The Grass House was a typical structure used as a shelter or house style that was built by tribes of the California cultural group who made them their homes. The dome-shaped grass houses were built with a willow framework covered with woven mats made of Tule (Southern Bulrush), Cattail or Giant Wild Rye that were secured with cordage. Learn about the structure and the interior of the Grass House with pictures and images together with facts and information about the tribes who used them such as the Chumash, Pomo and the Wintun people. Definition: The California Grass House, or hut, was a shelter that was constructed using a domed wooden frame, typically made with willow poles, that were thatched with grass mats made from the stems of Tule (Southern Bulrush), Giant Wild Rye or Cattail that were abundant in California. Who lived in a Grass Mat House? The Grass House was commonly used as a shelter and home by some of the Native Indian Tribes who inhabited coastal regions, rivers, lakes and wetlands where reeds and rushes grew in the present-day state of California. 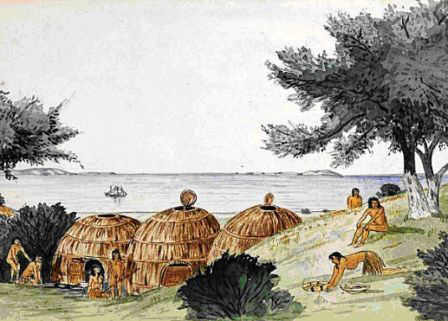 The names of the tribes who lived in the different grass mat style houses included the Chumash, Pomo and Wintun tribes of California. The Caddo, Witchita and the Yucci tribes of the Southeast cultural group used thatch to build their distinctive 'Beehive' Grass Houses. Plateau tribes also used tule mats to build tepee-shaped Tule Mat Lodges. The reeds and rushes used to build the Californian grass houses were Tule, Giant Wild Rye and Cattail. The Common Tule (Schoenoplectus acutus var. occidentalis) also known as the Hardstem Bulrush is found in California. It has a thick, round green stem that grows between 3 - 10 ft (1 to 3 m) tall with long, grass-like leaves and pale brownish flowers. The stem of the tule is the part of the plant used in making the thatch for the grass house. Tules once lined the shores of Tulare Lake, California, which was once the largest freshwater lake in the western United States. Giant Wild Rye (Leymus condensatus) is a bunch grass that stays green all year and grows 5 to 10 feet (1.5�m) tall in the California oak woodlands. Cattails (Typha) are 5 to 10 feet (1.5�m) tall have spearlike long leaves and grows throughout California. How was a Grass House built? How was the thatch made? The person on the outside of the frame put a bundle of thatch into place. An opening in the roof created a smoke hole which could be covered with a thatch flap.